Welcome to the May edition of the Digital Forensics Magazine Newsletter. Last months release of Digital Forensics Magazine Issue 14 was one of our most successful yet and we are looking to follow that in Issue 15. In this Newsletter, we bring you the latest news and all the details of what's in Issue 15 of Digital Forensics Magazine. De Montfort University’s (DMU’s) world-class cyber security centre has joined forces with business advisory firm, Deloitte, to launch an MSc in Cyber Security, the first collaboration of its kind in the UK. The degree brings together the academic expertise of DMU with Deloitte’s cyber intelligence specialists to help train the next generation of cyber security professionals. The DMU Deloitte MSc in Cyber Security will reflect all aspects of the cyber domain, from protecting the networks that control our buildings to the infrastructures that control the UK’s power stations and water supplies. Students will have the opportunity to examine common characteristics of cyber attacks, helping them to build psychological profiles of individuals most likely to commit cyber crime. DMU and Deloitte will work together to ensure students studying the MSc are highly-trained to stay ahead of the game, undertaking what is considered to be one of the highest priority threats to the UK. The MSc was launched at the House of Lords on Wednesday night in front of cyber security experts, business leaders and MPs including Chloe Smith, Minister for Political and Constitutional Reform, whose responsibilities include cyber security. Professor Tim Watson, director of the DMU Cyber Security Centre, said: “The UK desperately needs a new breed of flexible, highly-skilled and multi-disciplinary cyber security professionals and this MSc is designed to produce just that. “Working in close collaboration with Deloitte we have produced, and will continue to jointly develop, what we believe to be the best cyber security MSc course available anywhere." James Nunn-Price, head of cyber security for Deloitte, said: “Computing and the internet have changed our lives forever, and businesses and individuals have to deal with the growing threat of cyber attacks, which are increasing at an alarming rate. It is essential that the UK has the skills, strategy and techniques to tackle the cyber threats. Digital Assurance, an independent security assessment and information assurance consultancy, today announced it has been awarded CREST accreditation for the penetration testing services. Digital Assurance passed CREST’s rigorous assessment and certification process to demonstrate the very highest levels of standards in security testing. CREST is a not for profit organisation that provides industry and government recognised professional standards and qualifications for companies and individuals providing technical information security services. Only those businesses that apply the very highest level of expertise and professionalism to security and penetration testing are able to pass CREST’s highly technical certification programs and achieve the accreditation. CREST also provides its members with ongoing support and a framework for testing that includes standards, methodologies and processes. “For us, and our clientele, CREST accreditation is one of the hallmarks that embodies security best practice in ethical hacking and penetration testing,” said Mark Osborne, executive director, Digital Assurance. “Achieving CREST certification as a security consultancy testifies to our established technical expertise and validates the quality of our testing across the business. CREST is rapidly emerging as a key standard by which information security testing companies want to be measured and we’re delighted to be part of the scheme and make contributions to help shape the CREST standards as they develop in the future." Clarion Events today announced the successful launch of Forensics Europe Expo which took place 24-25 April 2013 at Olympia, London which received 3,239 attendees and 70 exhibiting companies to this inaugural event. Forensics Europe Expo, Sponsored by LGC Forensics, In Collaboration with Forensic Science Society and Organised in Partnership with The Investigator was launched to provide a dedicated forum for the entire forensics sector and supply chain to source forensics products, equipment and services, as well as providing the definitive source of education, best practice, training and networking. Forensics Europe Expo saw over 70 exhibitors across the entire forensics spectrum meet a wide range of visitors from; UK Police Forces, MOD/Armed Forces, Forensic Laboratories, Government Agencies such as HMRC, Office of Fair Trading, Local Councils, Private Sector companies and Universities. A sample visitor list can be provided upon request. The exhibition also benefited from the co-location with Counter Terror Expo with many counter-terrorism and security professionals with a remit to procure forensic solutions also visiting the show. The conference programme, produced by The Investigator, was split into dedicated Forensics Innovation and Digital Forensics streams across the two-day event. Presentations were delivered by organisations such as; West Midlands Police, The Forensic Science Society, DSTL, Netherlands Forensics Institute, Greater Manchester Police, LGC Forensics, and CAST to over 150 paying delegates. Companies interested in exhibiting at Forensics Europe Expo 2014 are advised to book early as demand is already high for current floor space. Interested companies should visit www.forensicseuropeexpo.com/2014 or call Zoe Bonser or Bilal Domah on +44 (0) 20 7384 7778 to find out more. News of the successful launch of Forensics Europe Expo comes hot on the heels of a 9% visitor increase to the co-located Counter Terror Expo. 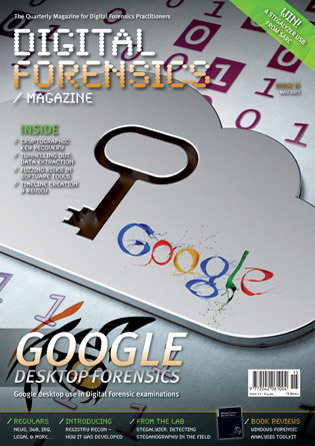 /Issue 15 of Digital Forensics Magazine Out Now! Issue 15 was released at the beginning of this month and focuses on alternative operating systems and desktop apps. Our feature article features an analysis of Google Desktop Forensics. Plus all our usual features "Apple Autopsy", "360", "IRQ" and "Robservations" "Legal news and alerts". Subscribe now to ensure you don't miss all these great articles.